A wedding cake can be a beautiful focal point. Whether you go big or keep it small, your cake should reflect who you and your groom are together. Finding your wedding cake baker doesn’t have to be hard, and the tasting can be one of the better experiences of wedding planning! These tips will help you get creative and find the best baker for your cake. Be sure to do your research. Find a few bakers in your area or near your venue before choosing one. Go through their portfolio to make sure their baking style fits the look your want your cake to be- but do *not* skimp on the tasting! Trust us. 2. Matching Your Cake To Your Wedding or To You and Your Soon-to-be Spouse? Everyone is different, so you both may love super heroes, but if an Avengers cake doesn’t match your winter wonderland theme, you may not be happy with the final product. On the other hand, you may want the cake to reflect your personalities, and let the theme fly out the window. At any rate, a good baker should be able to take your ideas, and turn them into a beautiful and classy cake that fits into your theme! Decide what tyoe of cake you’d like. Traditionally square or round and tiered? Oblong? Cupcakes and Rice Krispie Treats in the shape of a cake? This may be your chance to get creative, but work with your baker to make sure it’s still chic and delicate (or whatever look you’re going for!). Be sure to confirm with your baker about their cake building comfort levels (they’re all different, and that’s okay!). You don’t want to ask for an Eiffel Tower and get the Leaning Tower of Pisa. The decor will be very important to tying your cake to your wedding theme. From the icing to the toppings, you’ll want to draw focal points around your cake. (PRO TIP: ask your lighting designer if they have the ability to display soft lighting that makes sure your cake is a prominent piece of decoration!) 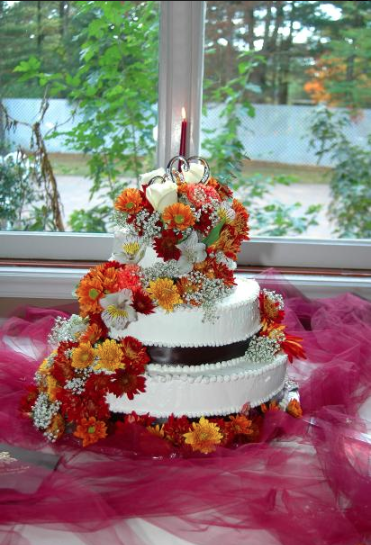 Play around with different ideas, such as topping your cake with flowers or fruit. Your cake may look good on the outside, but don’t forget about the inside. The fun part about deciding what your cake will be filled with is tasting all of the delicious flavors. Get creative with mixing and matching your flavors, accept suggestions from the baker, and most of all — have fun! This is one of the best parts of wedding planning; getting to unwind with your future spouse and fill up on sweets! Whether your cake is a huge work of art or an intimate masterpiece, you’ll have a great time exploring the different choices your baker has to offer. Don’t be afraid to get creative with your design, but keep in mind that less is often more! In the end, all that matters is that you two love it.